The Migration Setup tab contains tools which are useful when migrating data to a Salesforce instance unrelated to the Salesforce instance used to create the CopyStorm backup. This is useful when trying to perform tasks like mapping Users in a CopyStorm backup to users in the target Salesforce. In this case, Salesforce Ids will not work due to being unique to a Production or Sandbox instance’s setup. 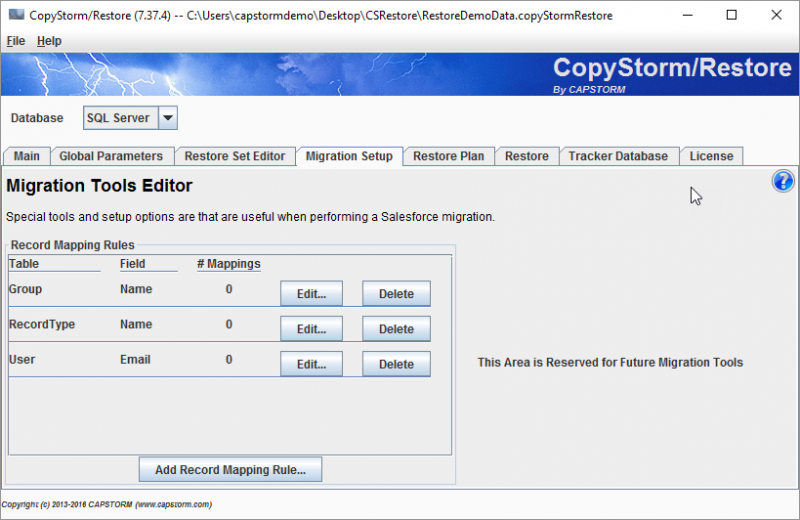 The Record Mapping Rule tool on this page supports implementing and establishing rules that CopyStorm/Restore will use to map users from the CopyStorm backup to users in the target Salesforce. Click here for documentation on setting up Record Mapping Rules.